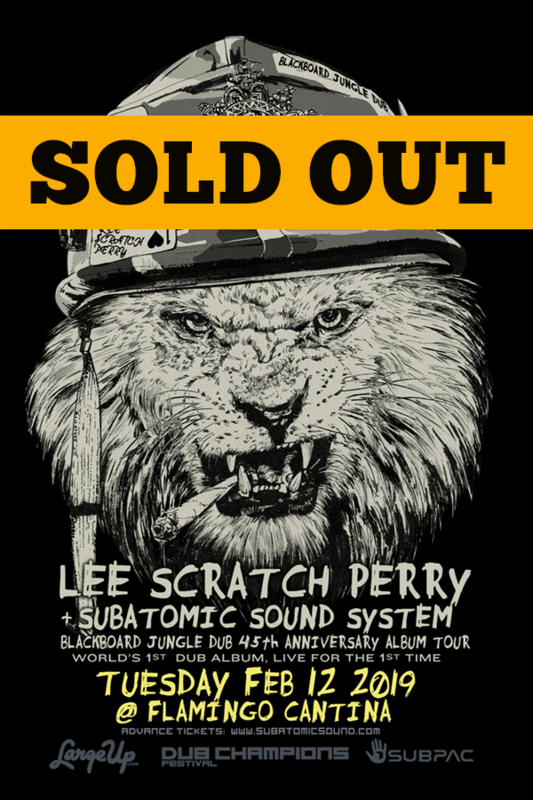 Grammy winning dub & reggae pioneer Lee “Scratch” Perry celebrates the 45th anniversary of his landmark album “Blackboard Jungle Dub”, the world’s first dub album, by performing it live for the first time on tour. Scratch, now 82 years young, will embark on a tour across North America beginning February 2019 performing his 1973 studio masterpiece live in its entirety for the first time, aided by the technology of NYC’s Subatomic Sound System, his hybrid band of new school electronics and veteran Jamaican musicians from the Black Ark era recordings (http://bit.ly/BJD45t ). They will also perform music from their album “Super Ape Returns To Conquer” ( http://bit.ly/SS033s ) which topped both reggae and electronic charts in 2018, plus singles like “Black Ark Vampires” (http://bit.ly/BAVss ) and classics from Perry’s work with the likes of Bob Marley, Max Romeo, and many more. Perry’s Blackboard Jungle album includes dub remixes of hit songs he co-wrote with Bob Marley, “Kaya” & “Keep On Movin”, as well as other big tunes from The Wailers and Junior Byles. Kaya turned out to be Marley’s most successful album of his career and celebrated its own anniversary with a massive festival earlier this year.